Generally there are two types of estimates namely Original Estimate and Repair Estimate. In this regard, S.L. 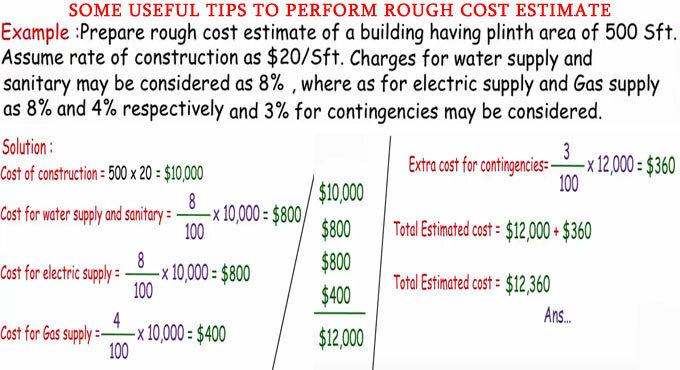 Khan, the renowned civil engineers presents an exclusive construction video tutorial where he briefly explains the method of rough cost estimate. 1) On the basis of plinth area of structure. 2) Per unit number method. 3) Cubic rate estimate. 1) Workout the total plinth area of structure. 2) Approximate rate of construction per unit area. 3) Boundary wall length and cost of construction . 4) Add cost of water supply and sanitary about 8%, 4,4 for each. 5) Add cost of electric and Gas supply (electric = 8% and Gas = 4 %). 6) Take cost for contingencies of total above cost (about 3%). 7) Find out total cost. To make your conception more clear, a problem along with solution is given in the video. Problem : Make a rough cost estimate of a building that contains plinth area of 500 square foot. Suppose, the rate of construction as $20/Sft. Charges for water supply and sanitary are taken as as 8%, while for electric supply and Gas supply assume 8% and 4% respectively and 3% for contingencies. To get the detail solution of the above problem, go through the following video tutorial.